Your self talk has a powerful impact on your success in any endeavor but particularly when building your network marketing business. The words you are using all day long can either lift you or tear you down. Your self talk can either lift your mood or ruin it. Attract abundance or repel it. It is important to release the negative emotions and keep the energy in a positive state. Your emotions affect your energy. Your ABUNDANCE attracting energy! They affect the way you do things in your business. The negative emotion affect the way you step up and talk to people. This is important because network marketing is a business where you talk to people. Emotional Freedom Technique, sometimes called Tapping, is an awesome way to shift a negative energy and move into a more positive abundant energy. Affirmations can be helpful in redirecting our thinking and self talk. If you are having a bad day and you are feeling really negative, repeating affirmations over and over in your head can really help shift your mood. That’s why, when someone asks me how I am, I like to say, “I am AWESOME!! !” or something similar. Never respond with something negative. Even if I have had a horrible day, I like to try to shift my mood with something that can be like an affirmation. I used to know someone who would respond, “I’m doing great and I know it just keeps getting better!” I love that one and occasionally will use it as my response. Now, be reasonable here. There are times you are not going to do that. If someone just died or some other really sad thing happened it would not be appropriate. I like to enhance affirmations by tapping on the EFT points as I focus on the affirmations. You can use Emotional Freedom Technique to shift your energy to a more positive vibration. Add some essential oils and really power up your Affirmation Tapping. I like Abundance oil for business related Affirmation Tapping. Make sure your affirmations are positive, NOT negative. For example: Rather than saying, “I am not attracting rude, grouchy distributors”, say, “I am attracting strong, confident, successful business builders who love the product.” Say whatever feels uplifting and empowering to your abundance. I am attracting a Royal Crown Diamond team of distributors. I LOVE that I am attracting strong, confident, successful business builders. I am GRATEFUL that abundance flows to me through my network marketing business. I am a very successful, magnetic leader. Every CELL in my body is full of ABUNDANCE. I radiate ABUNDANCE & I am like a MAGNET attracting MORE ABUNDANCE. I am a confident and successful leader. I am comfortable in front of people. Add Abundance oil or another essential oil to your fingertips before you begin tapping through the EFT Points. You can also tap the fingertip points. I sometimes tap these points discreetly when I am in public. Each finger can be tapped at the base of the nail. Think of a positive affirmation that will help shift your energy to a more confident one. Tap each point repeating the affirmation as you tap each point. You can say multiple affirmations as you are tapping if you choose. While you are doing this, try to keep a smile on your face. There is something about smiling that super charges this process. Always be aware of the words you use and how they impact your emotional and abundance energy. I learned “WHAT IF” tapping from Carol Look, one of my favorite EFT mentors. Adding the question, WHAT IF? to your tapping allows you to imagine the possibilities, looking beyond what you see in your life right now. It is our limiting beliefs that can get in the way of the success we would like to see. It is important to believe you can achieve your goals. If you have the belief that getting to the rank of Diamond in your network marketing business, will happen for other people but not for you, this limiting belief can get in the way and become a block to your success in the business. Use the What If tapping to look beyond your limiting belief to visualize the possibilities and What if YOU can TOO? When you feel any limiting beliefs coming up, focus on those and keep tapping through the points and releasing the limiting beliefs. For this tapping, I like to use essential oil blends that help you relax and think about the future. A few Young Living Oil Blend possibilities are: Envision, Believe, Build Your Dream, Magnify Your Purpose, Transformation, Into The Future, Valor. There are lots of possibilities for oils to use. Go with whatever feels right to you. The added essential oil is not necessary but the oil helps infuse extra energy into your tapping session. Even though I don’t believe I deserve an abundantly producing business, WHAT IF I have been wrong about this? Even though building to the rank of Diamond works for other people but not me , WHAT IF I could build to diamond, even Royal Crown Diamond? Even though I’m convinced i could never build a really abundant network marketing business to Diamond, WHAT IF it IS possible for me and I am about to build all the way to Royal Crown Diamond? What If I really could build this business really big? What if I have learned someone else’s wrong limiting belief about success being for other people but not me? 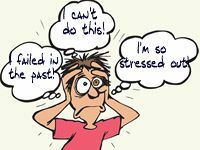 What if the limiting beliefs I have learned are NOT TRUE? What if I am in control of all of these limiting beliefs? What if I am a really powerful business builder? What if I really am a Royal Crown Diamond in the making? What if all I have to do is believe it’s possible? What if I can release these limiting beliefs and blocks to my building an abundantly successful network marketing business? What if I can actually build my business to the rank of Royal Crown Diamond? What if I am just as deserving and able as anyone else who has built a successful network marketing business? What if I do have what it takes to build this business as big as I want it, all the way to the top rank? What if I really CAN do this? What if I DO deserve an abundantly successful Royal Crown Diamond sized business just as much as they do? What if I am releasing these blocks and limiting beliefs right now? What if I am advancing to Royal Crown Diamond each and every month? What if I really could believe it? I’m not so different as they are! I’m sure some of them had limiting beliefs too. They just kept moving forward toward the goal! One Income Producing DAY at a time! I can do that too!!! I have oils and EFT to help me. I’m tapping away any limiting beliefs! I am releasing the emotional attachment to the belief that I can’t build this business all the way to Royal Crown Diamond! I really CAN do this! 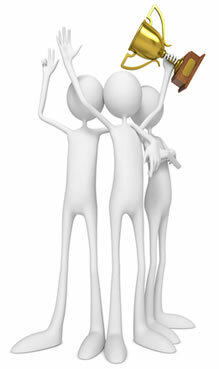 I am attracting strong, confident, successful business builders and we are building to Royal Crown Diamond TOGETHER! 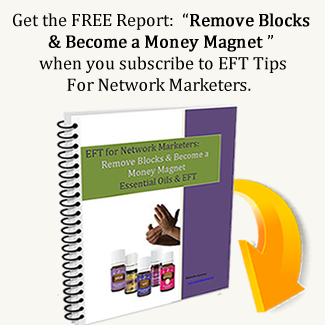 Get the FREE Report: "Remove Blocks & Become a Money Magnet "
when you subscribe to EFT For Network Marketers Newsletter. You'll get EFT Tips and tapping scripts for enhancing your Network Marketing Business.